If you mention going on a picnic in the blazing-sun-with-the-marauding-insects meaning of the word, you'll see my jaw clench and my shoulders tense. I don't like picnics. To me, balancing plates and wine glasses AND fighting the elements at the same time is stressful and exhausting. But if by picnic you mean throwing a rug in the middle of the living room floor and loading Game of Thrones in the Blu Ray machine, I'm there baby. NOTE: If you don't have time to make your own pastry, or the thought of making your own gives you a nervous breakdown, use two sheets of store-bought flaky pastry. Place flour and salt in the bowl in a food processor and pulse briefly to mix. 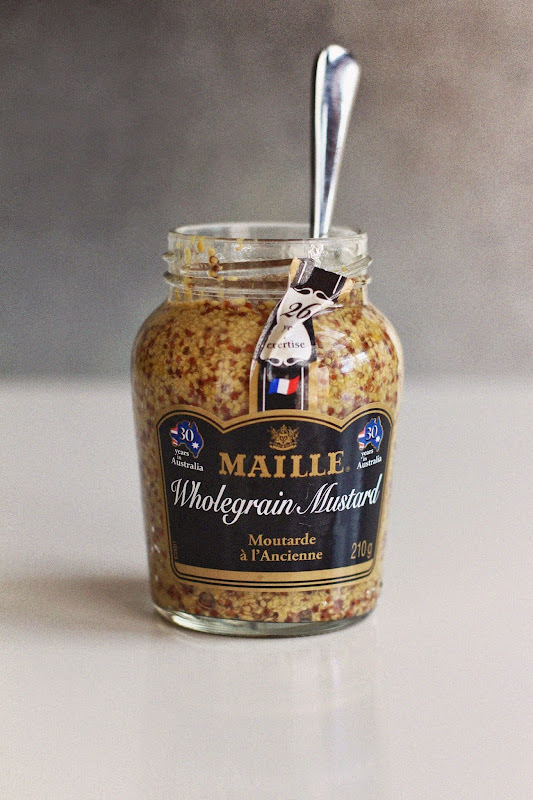 Add the butter and blitz until the mixture resembles large breadcrumbs. Add enough cold water to form a ball around the blade. Turn out into a lightly floured work surface and bring together with your hands. Form it into a ball and wrap the dough in plastic wrap and refrigerate for 30 minutes. Roll out dough into a 30 x 15 cm rectangle. Fold in the two short ends to meet in the centre, then fold in again. 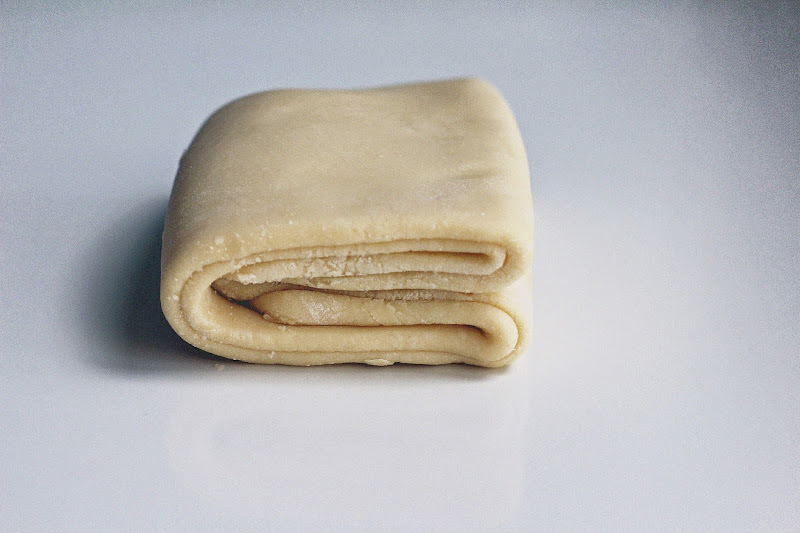 Roll the pastry into a 30 x 15cm rectangle again, then repeat folding process. Refrigerate as a small rectangle for a further 30 minutes before using. Preheat the oven to 190 C and slide in a baking sheet. 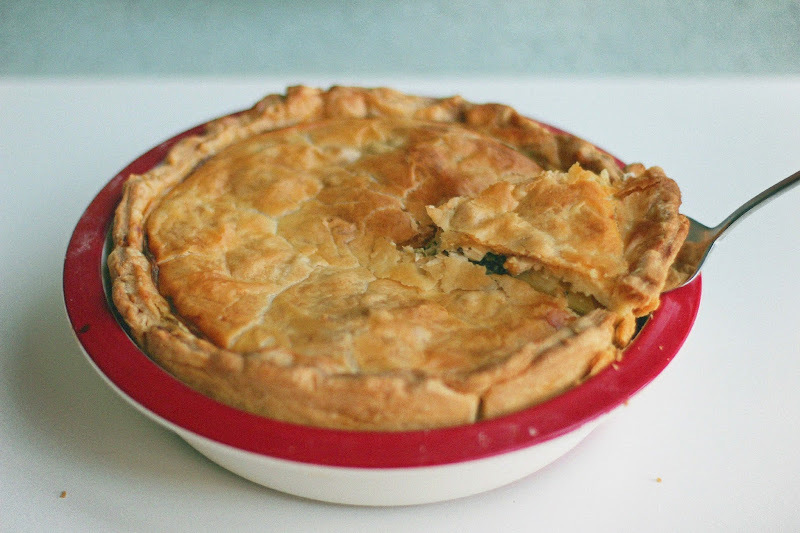 Lightly spray a 25cm round pie dish with cooking oil spray and set aside. 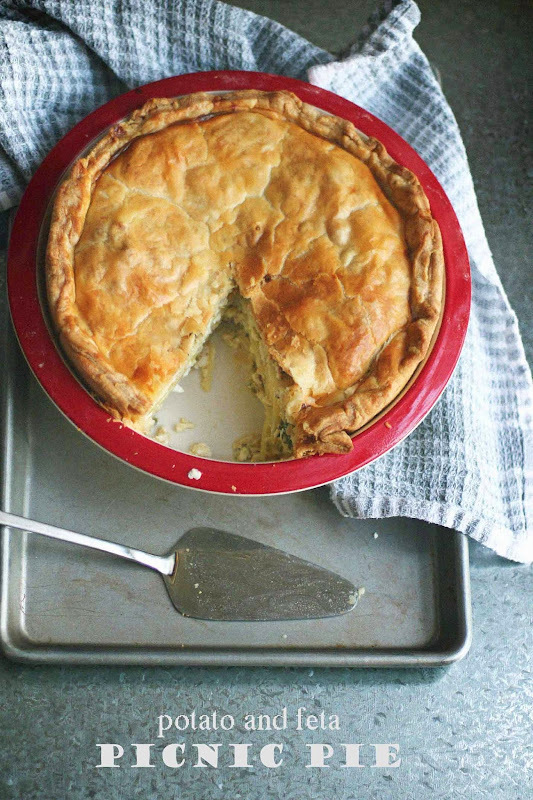 Take the pastry out of the fridge. Divide into one 2/3 portion and one 1/3 portion. Take the larger portion and roll it out thinly to fit the pie dish. Line the base and sides of the pie dish with it. 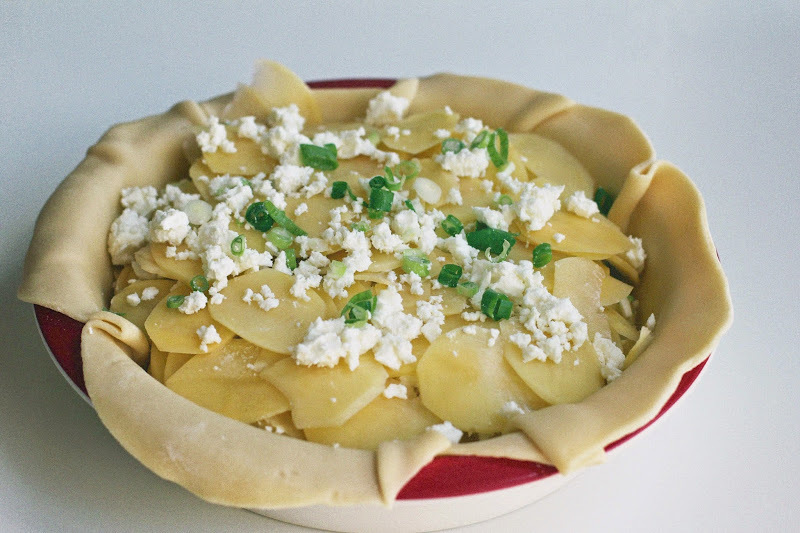 Layer the potatoes into the pastry shell, sprinkling some onion slices and crumbled feta over each layer. 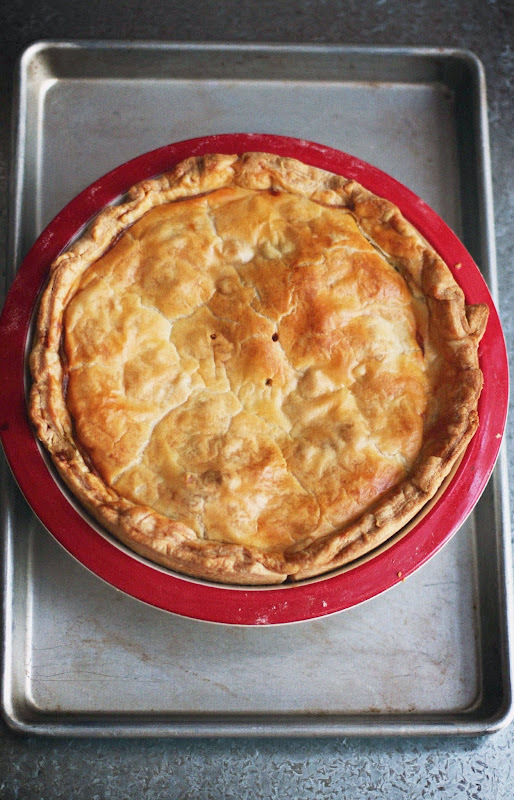 Take the smaller portion of pastry and roll it out thinly to create the top of the pie. Place on top of the filling, pressing the edges firmly together to seal. Cut off any excess pastry and crimp the edges. Brush the top of the pie with the egg and milk mixture. Put the pie on top of the hot baking sheet and bake at 190 C for 45 minutes. 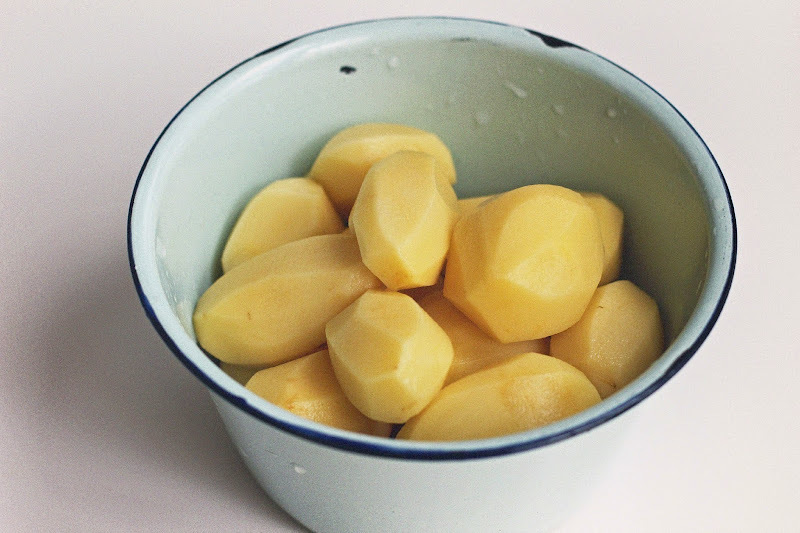 Reduce the temperature to 160 C and back until the potatoes are tender (about a further 50 - 60 minutes). The potatoes will be cooked when a skewer inserted into the middle of the pie meets with no resistance. I have a bunch of potatoes I need to use up... THIS IS HAPPENING! Looks so dang good! I think you'll love this Marie. That is my favorite kind of picnic. 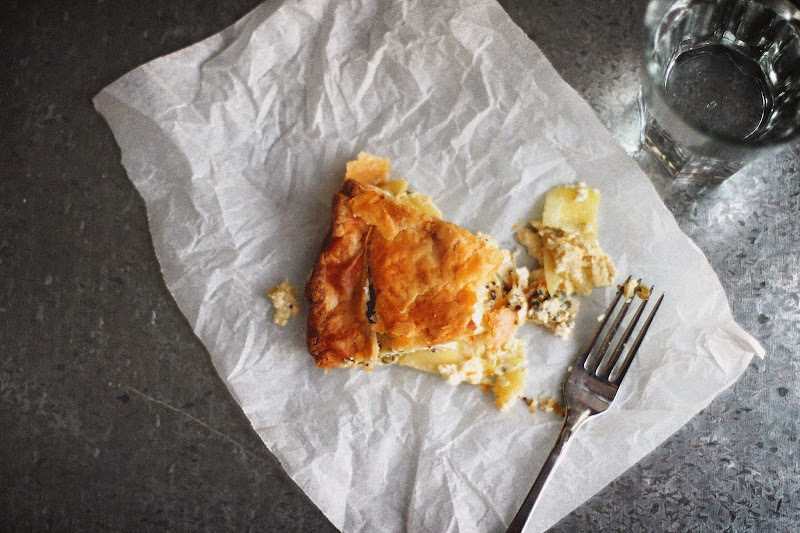 And I love this pie... almost a potato gratin (with the most perfect cheese ever - feta) but all wrapped up in puff pastry. And I love this quick puff pastry recipe, too. Perfect, I say. 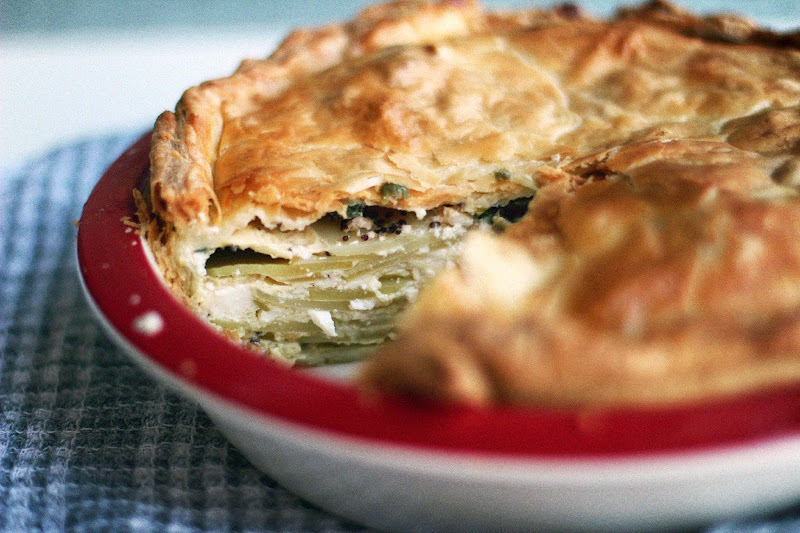 Yes, it's pretty much potato gratin in pastry. That can't be bad, right? Ha ha. I'm an indoor picnic girl. Potato Pie? Carb on carb action! I am all there. Add some feta and some spring onions and I am definitely under your spell! Given that the boyfriend is ginger and burns easily all picnics will take place in the living room, usually accompanied by Anthony Bourdain on the TV so I can't complain. On the list! Living room picnics = best picnics ever.